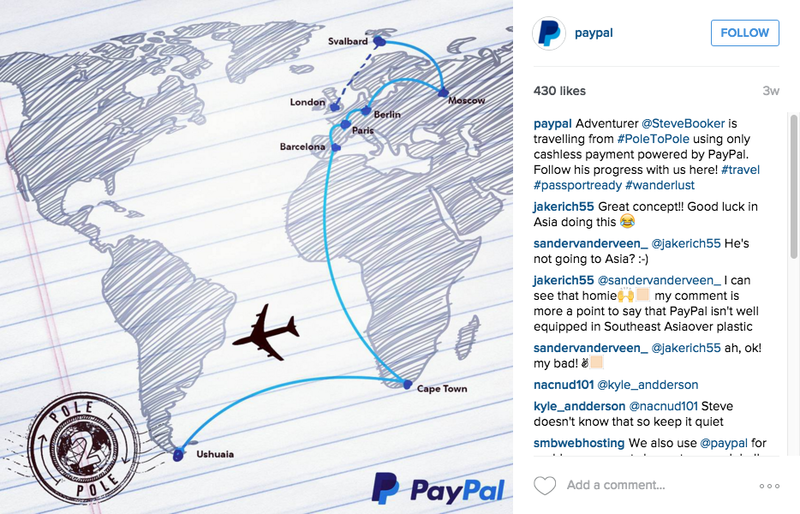 PayPal recently teamed up with London-based Travel Blogger and Youtuber Steve Booker for a new epic campaign. Eight countries, three continents and a journey spanning from Pole to Pole. The ultimate travel adventure, but with a catch. Steve Booker was given the challenge of completing the exploration without carrying any cash, using only electronic payments through PayPal. More and more brands are seeking out to top travel vloggers to create and execute new marketing campaigns. With this new "PayPal #poletopole" campaign, PayPal positions itself as a "perfect partner for anyone looking to make their own dream adventure reality", building and driving brand awareness through both the authentic campaign challenge and the sponsored content on multiple social media channels. If Booker can travel from Pole to Pole without spending any cash (! ), surely everyone can use online payments in daily personal routines. Find out more about the #POLETOPOLE adventure on Passionpassport via PayPal or Steve Booker's Youtube Channel. Find out more about Influencer Marketing Case Studies on Mediakix.